The game of golf is all about focus and technique. It takes great skill and concentration to not only hit the ball correctly but to make it go in the direction you want it to. With outside factors and advanced techniques aside, the basis of a great technique lies in a solid foundation: your swing. Improving you swing isn’t just about repetition, though that is a big part of it. 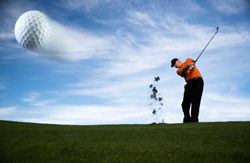 Golf requires motor memory, which is essentially the image of a swing being translated into your motion. While repeatedly practicing you swing is a good idea, you need to ensure that the swing you practice is great. Here are a few tips to improve your swing for a better game. The way you stand is an important part of you swing, as it allows your body to perform the necessary tasks involved in the swing and follow up. 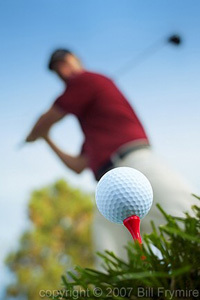 Novice golfers often make the mistake of simply walking up to the ball and taking their shot. Effective shots require an effective stance. First and foremost, your feet need to be shoulder-width apart with your entire body parallel to the target. If you are practicing, it’s always a good idea to have a target to aim for, be it a flag in the distance or simply a mark on the wall. Having your right foot forward from the body will allow your weight to transfer to the inside of your foot and push away during your swing. Your upper body should lean in slightly as your knees bend comfortably. This gives you flexibility. By perfecting your stance, you’ll be able to drive the ball effectively and comfortably. It’s a good idea to practice the stance enough to where you don’t even think about it as you approach the ball. Even with the right stance, balance can become an issue that hinders your swing. If you tend to rock to one direction during your swing, your body is going to compensate the difference, affecting your swing. This may be undetectable, even to someone who’s been playing for years. Improving your balance will give you more control than ever. One way to improve balance is by repetition. However, you won’t improve if you can’t even detect the imbalance. By standing on a foam log, the unbalance in your swing is exaggerated. Practicing on this foam will allow you to make adjustments and stay still. Once you’ve fixed the balance issue on the foam, you’re ready to swing on the ground. Another issue that gets in the way of a successful shot is the path of your swing. It’s not as simple as up and down or left to right. The path of the club should follow a tilted arc. As you prepare you swing, the club is at the top of the arc. Throughout the swing, the club follows the tilted arc to hit the ball, continuing in the follow-up. If your stance is perfected, improving shouldn’t be an issue. 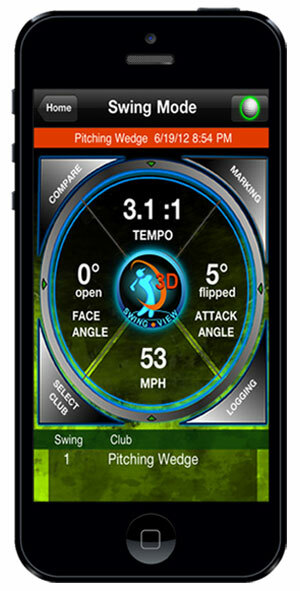 One of the best ways to monitor your path is with a golf-swing analyzer. 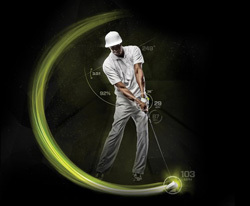 Analyzers will measure every detail about your swing so that you can make slight adjustments for improvement. Once you’ve found out what’s wrong with the path, you can alter the weight distribution on your feet, the movement of your arms, or any other mechanism in your body to get it right. During a swing, tempo is key. Professionals golfers almost always have a set tempo in their swing. It comes from perfecting the way their body moves and reacts to the motions. While it may be tempting to swing as hard and as fast as you can, that’s not always the best approach. Swings don’t need to be fast to be effective. Slowing down your swing allows you to get a better feel and understanding of your body. You body will be able to square the club better and you’ll have a better comprehension of your body’s weight distribution as it follows the swing path. By slowing it down, you’ll know when and where you body shifts and moves, allowing you to get the most power possible. By slowly building up your speed, your body and mind will remember what it needs to do during your swing. Constant practice at a slow speed ultimately allows you to perform the necessary tasks in time, regardless of how fast or slow your swing is. While practice makes perfect, it means nothing if you can’t perform the same way during a real game. This is a common issue among those wanting to perfect their swing. Golfers tend to swing great during practice, but underperform when it comes time to hit a ball. This is because there’s an actual ball to hit. When you’re simply practicing your swing, you’re not aiming for a ball. While this allows you to practice your muscle movements, there’s nothing challenging you visually. When a ball is introduced, your brain is focused on the target, essentially ditching everything you’ve worked towards. To overcome this change in visual focus and muscle memory, you need to practice with a target. A visual cue will train your brain to focus on more than one thing at a time. You’ll be able to focus on the ball in addition to everything else, such as your stance, swing path, balance, and much more. A simple blade of grass works well as a visual target. This allows you to practice brushing the ground at the same exact spot every time.